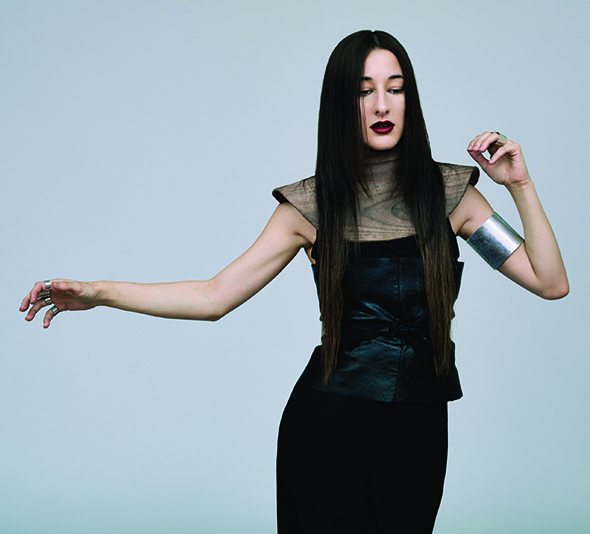 It’s been two years since Zola Jesus (real name Nika Roza Danilova) has taken the stage, and a tangible evolution has since occurred. Emerging from a writing hiatus, nine months of which were spent on the isolated and ethereal Vashon Island in the Puget Sound (Washington state), Danilova spent that time cultivating a new sound: one that explores new corners of the pop genre without abandoning traces of her background in the darker genres. The October release of her sixth studio album, Taiga, marks a transformation in Danilova’s work. The opening performance was held at San Francisco’s gem of a venue, Bimbo’s 365 Club, where a geometric, angled iceberg served as the backdrop of the rendition, and alternated between a steady glow and flash- ing sequences set to the primal heartbeat of Danilova’s songs. Her backing band is an impressive ensemble that includes brass and string sections that flesh out Danilova’s monolith vocals to create a full, immersive sound for the audience. Though tiny in size, Danilova commands the room through the vast depth of her songbird range. Searing with emotion yet controlled with a needlepoint precision, Taiga’s songs are filled with potent lyrics, executed with the fine-tuned ferocity of Danilova’s trills. The evolution of her performance, expression and appearance stems from a deep-seeded connection to the complete vision of her album. Taiga, the Russian name for the country’s boreal forests, describes not only Danilova’s collection of songs, but several larger concepts as well. The push-and-pull opposition that exists between man and nature is a primary theme, with Danilova expressing her view that humanity’s overwhelming “need” to dominate the natural world only proves our innate sense of separation from our flora and fauna neighbors on this planet. Taiga’s single,“Dangerous Days”, cracked the top 20 on Billboard’s Emerging Artists Chart and its video (directed by Tim Saccenti, whose roster of knock-out collaborators includes everyone from Depeche Mode and Animal Collective to Pharrell and LCD Sound system) lays out Danilova’s vision of sweeping forests and breathtaking nature. Situated mostly in front of a bejeweled lake and forest-draped mountains, Danilova sings to the camera while donning a creative combination of tribal and futuristic garb. The look is one that balances past and present, ancient and modern, and Danilova’s switch from mid-length blonde locks to dark chocolate strands that brush her waistline completes the transformation from ‘alternative’ to a totally original embodiment. Back at Bimbo’s in San Francisco, Danilova entrances the audience through a mixture of operatic vocals and ecstatic dance, thrashing about in elegant violence as her angled iceberg vibrates colors in sync with the band’s gut-punching rhythms. A modern, re-worked kimono is a signature costume of Daniolva’s throughout the tour, along with fistfuls of chunky, armor-like jewelry. The result is an enchanting weave between Danilova’s raw, primal roots and the sleek agility of a polished warrior. Taiga was mixed by Dean Hurley, the resident engineer at the legendary David Lynch’s studio, and marks Danilova’s first release on Mute Records, after having left Sacred Bones. Though she has stepped away, Danilova says she still calls her former labelmates “family” and points out that the move was a necessary stepping stone to the level of success she is working toward (and capable of ) achieving. Mute Records, the legendary British collective formed in 1978, has been the home of numerous Danilova inspirations, such as Depeche Mode, Moby, and Goldfrapp, and the label’s history of supporting avant- garde, visionary artists looks to be a perfect launching pad for Danilova’s career. Danilova’s chart-topping aspirations have been questioned in the past, but she’s already well on her way to forging a new corner of the pop industry—one that draws on her lo-fi, noise and punk foundation to add a fierce edge that you won’t find on American Idol anytime soon. Artists like Lorde, Sia, and Ellie Goulding illustrate a sector of the industry’s steer away from the cookie-cutter nasal vocals and soft femininity days of lore. A new generation of hard-hitting femme fatales has taken the stage, and they are starting to command the airwaves on a noteworthy scale. With a rapidly-expanding fan base, Danilova is poised to become the face of the next wave of pop music. This warrioress of sound is paving a new road toward the mainstream, and her innovative approach is catching the eye and ear of youth around the globe. 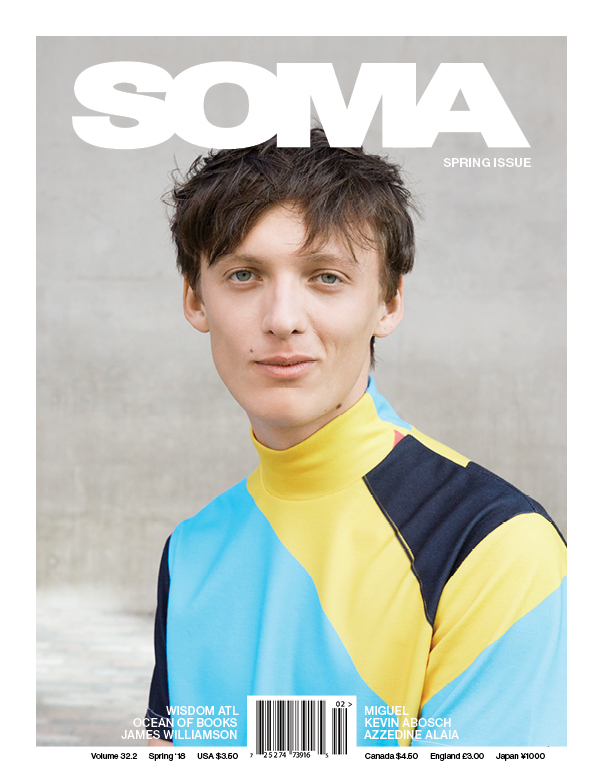 Taiga proves to be a manifesto of new proportions for Danilova, and we at SOMA can’t wait to watch the next chapter of the Zola Jesus story unfold.